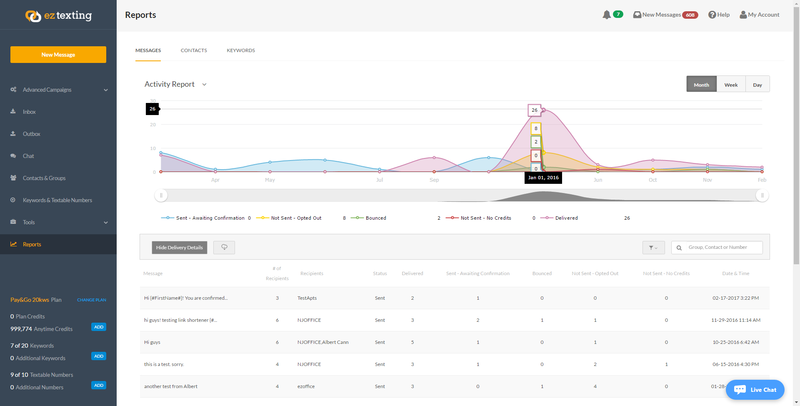 The Activity Report's advanced filtering capabilities allow you to access, view, slice, and dice your campaign data like never before. Gain insights from the Activity Report to gauge the health of your campaigns, and optimize them based on those insights. Use the report's date- and campaign-level filters to select exactly the data you need. You can filter by specific contacts or groups, message origin (inbound or outbound) or type (SMS, MMS, etc. ), message tags, and more. Grouping options allow you to view the data by the timeframe you choose. The Activity Report has two sections: a graphical chart, and a details table that contains the data represented in the chart. Export options include a report summary, which provides the data that is shown in the report's detail table, or report details, which provides all underlying data used to generate the report. Measure your outcomes. Adjust your strategy. And grow!